Not all heating systems are plumbed with a single heating circuit, some may have each floor of the property split onto a separate heating loop or there may be boilers heating different parts of the property. For these scenarios, the heating zones are 'grouped' via Group zones. A group zone allows you to create a zone, similar to a child zone, which always calls for heat when zones in its group call for heat. For example if a first floor bedroom calls for heat, then the group zone controlling the zone valve for the first floor will open allowing hot water to flow through this circuit to reach the bedroom. In properties which have separate heating loops or boilers, they allow the heat to only be sent to the pipes which are required rather than heat up all of the pipework each time a zone calls for heat. These group zones are displayed on the My House page, in a special tile at the top of the page with a circular indicator for each of the group zones. 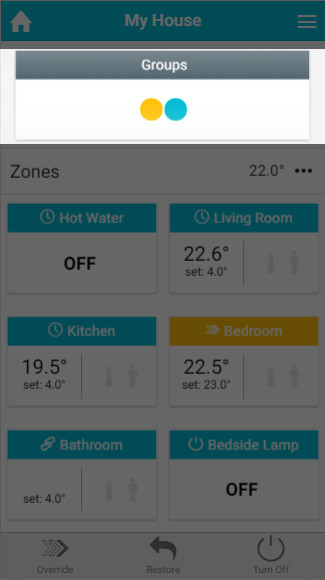 These indicators will change colour, like tiles and the room list indicators, to show when a heating zone in that group is calling for heat. To see which group zone is being heating, click on the Groups tile and a list of all available group tiles will be displayed. Alternatively, on a desktop you can hover over the dot to display the zone name. How to link a Group Zone to a zone. From the My House page, click on the Group Zone you would like to modify. Click on the zone's sub-menu. On the Quick Actions bar, click on 'Link to zone'. Select the parent zone(s) to link to. From the My House page, click on the Group zone you want to remove a linked zone from. Click on the broken chain icon next to the zone you do not want the Group zone to follow.